This week, states are meeting in Geneva for the annual Meeting of States Parties of the Anti-Personnel Mine Ban Treaty. The treaty has now been operating for almost 20 years, and was initiated in response to the humanitarian harm caused by landmines. A more recent international initiative for the protection of civilians, the Safe Schools Declaration (SSD), is a response by states to the global problem of attacks on education, the military use of schools, and their humanitarian and human rights impacts. Through a series of political commitments, the SSD (which was launched by Argentina and Norway in 2015) creates a framework for recognising and responding to the short and long-term harms caused by attacks on education and the military use of schools. There are a number of mutually reinforcing connections, and common underlying principles, between humanitarian mine action and initiatives to protect education from attack during armed conflict. 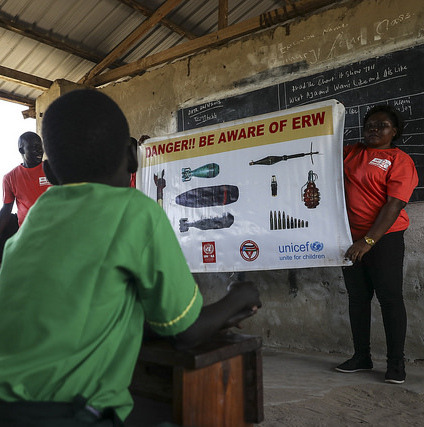 For example, focusing on the clearance of explosive remnants of war (ERW), mines and booby traps from schools can support continuity of education for students. Furthermore, both priorities are underpinned by humanitarian norms, and the imperative to strengthen civilian protection and the upholding of international law. In a new discussion paper released today, Article 36 looks at these connections and how they could be strengthened. Our paper considers: how the mine action sector can support the SSD’s principles and goals; how states’ work to implement the SSD can be advanced through humanitarian mine action; and how the SSD could, in turn, help to support the work of mine action operators. Initiatives to mobilise states and others around the strengthening of international humanitarian principles and law represent positive developments at a time when such norms are increasingly under threat on different fronts. Communities that rely on these principles should work to support each other to strengthen these broader frameworks, whenever connections can be usefully made. This paper draws links between the SSD and humanitarian mine action in this spirit. Take steps to connect with the safe schools community of states and organisations, share data on attacks and the military use of schools, and share relevant expertise and information about interventions in areas such as victim assistance. Encourage non-endorsing states to endorse the SSD.